Whereas health workers are generally well aware that exposure to heat poses a potential risk to vaccines, the risk of freezing is less widely known and is actually greater as it is less visible. The widespread use of VVM for all vaccines procured through UNICEF enables health workers (or even mothers coming to the vaccination sessions) to see that the vaccine has not been exposed to excessive heat during its journey from the supplier to the point of inoculation. For freezing, the diagnosis is more difficult as the shake test is only performed if the health workers think/know that the vaccines have been exposed to freezing temperatures. Health workers should be trained in the procedure to do a shake test. They must be aware that some vaccines cannot be used for that purpose (the Inactivated Polio Vaccine, IPV) as the results would not be conclusive, i.e. it would not prove or disprove that freezing of the vaccine has occurred. Training should reinforce the understanding of why busy health workers are requested to perform routine temperature readings every day and why it is an integral part of their work. 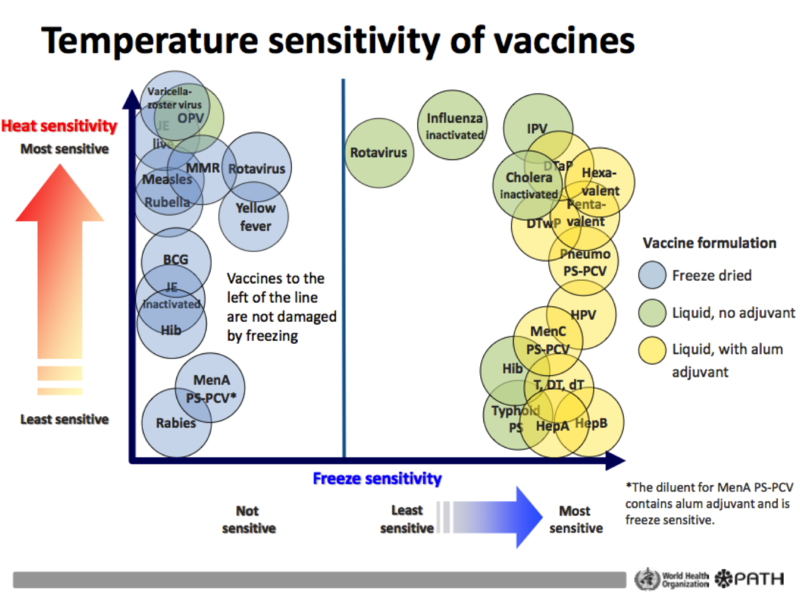 With the increase of the number of freeze sensitive vaccines, not only health managers but also health workers should receive proper training during the introduction of new vaccine and at regular intervals subsequently to know which vaccines are most freeze-sensitive (as shown in the WHO/PATH table on vaccines thermosensitivity below) and how to load cold rooms, refrigerators, vaccine carriers and vaccine cold boxes accordingly. The WHO document "Immunisation in practice, Module 2: The vaccine cold chain" provides extended technical information on the above but countries might benefit from translating the main instructions into pictograms to be displayed on site. It is good to be constantly reminded. The documents below can be used for re-training. Poster issued by PAHO to explain how to perform the shake test. Poster issued by WHO explaining the use of VVM in English (old version). Simple poster issued by WHO explaining the use of VVM in French (old version). Simple poster issued by WHO explaining the use of VVM in English. Simple poster issued by WHO explaining the use of VVM in French. Short quiz on temperature surveillance in the vaccine supply chain, can be used for training.